Following the contributions of each of the speakers, there will be a Q&A session. A number of Saor Eire veterans will be in attendance and hopefully will take part in the discussion. These include Frank Keane -Des Keane and Liam Sutcliffe. Interview with Greg of the Australia Asia Worker Links group that highlights ongoing struggles and conflicts in Asia and seeks to build practical solidarity and support. On the weekend of 22nd – 25th August Dún Laoghaire will host a series of events to mark the centenary of the 1913 Lockout. The weekend will kick off with the launch of an exhibition ‘Dún Laoghaire & The 1913 Lockout’ and a Commemorative Book. The exhibition and book will be launched by Myles Dungan, historian and broadcaster with readings by Martina Devlin, author and journalist. This launch is on Thursday 22nd August at 6:30p.m. in the National Maritime Museum (Moran Park), and the exhibition will run at this venue until 18th January 2014 – the same period as the 1913 Lockout. The Commemorative Book will feature contributions by Padraig Yeates, Joe Duffy, Myles Dungan, Martina Devlin, May Moran and Mike Lee and will be available for sale at the launch and at all the weekend events for €10. Conversation with Dimitris, a Greek anarchist living in Melbourne, co-founder of Anarkismo and translator of many English anarchist publications. I began by asking Dimitri, who became active in anarchism after a background in the Greek Communist Party, the nature of austerity in Greece and resistance to it. We also discussed briefly the history of Greek anarchism, its strengths and weaknesses in contrast with anarchism in Australia. An Irish anarchist living in Melbourne, Australia gives his perspective on the 'asylum seeker' debate there leading up to the forthcoming elections. He argues Irish workers should be standing in solidarity with the most marginalised and dispossesed in our society. 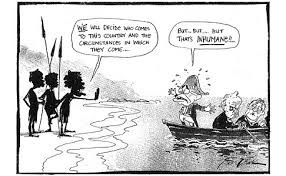 In the words of one Aboriginal activist; ' “As people who know what it’s like to be invaded by boat people we are in a better position to judge how the current boat people should be treated. Where the original boat people who took our country were armed to the teeth and bent on conquest, asylum seekers in 2012 are unarmed and seeking sanctuary." Questioning Queer Politics: Is "Marriage Equality" Enough? This post- Melbourne Anarchist bookfair conversation took place in the Melbourne Anarchist Club (MAC) which has a history stretching back to the 1890s. While visiting the premises which contains a library, meeting space and infoshop I caught up with Brendan and Ben two active members of the collective and Kieran from Anarchist Affinity which is seeking to build a similar organisation to the WSM, based on theoretical and tactical unity and collective responsibility. Topics discussed included the history of MAC, opinions on the third Melbourne bookfair, struggles engaged in by anarchists, and the potential for building a viable anarchist movement in Australia. Other areas discussed included Australia's treatment towards refugees, it's history built on the genocide and dispossession of its indigenous people and ongoing land struggles. The eruption of conflict and intense rioting in Belfast over the last couple of months is a clear illustration that, no matter what lengths Stormont and the media circus go to to disguise the ugly reality of the ‘peace process’, the scars of the past and frequent eruption of sectarian conflict refuse to go away as political parties play the sectarian card to get one over on their rivals. With over 300 police officers apparently injured so far this year, the honeymoon period following a 'successful' G8 conference has long passed - lifting the veil from a colonial sectarian settlement that has delivered a few crumbs to our class while the rich get richer. While at the same time our rulers in Stormont are busy stuffing themselves with £250,000 subsidised food expenses in 2012.